The Lazy Heart Grill occupies both the brick front building with our logo on the front and the yellowish colored building to the right in the photo on the left. 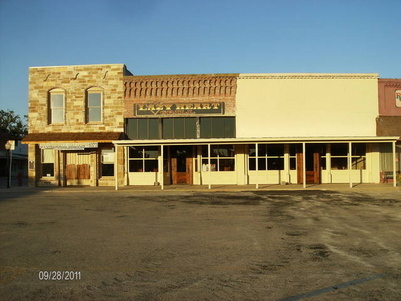 The Stonewall Saloon Museum is located on the corner just next door to the Lazy Heart. The Lazy Heart Grill is a full service, dine in restaurant located in historic Saint Jo, Texas. Our name, The Lazy Heart, stems from my grandfathers cattle brand. "Grandy" had an old forged steel branding iron in the shape of a heart that he branded his cattle with. He used the brand with the heart in its verticle position. When my parents started in the cattle business they used the same heart shaped brand but turned the brand upside down to distinguish their cattle from grand dads. When my brother and I started in the cattle business we used the same brand but turned the branding iron on its side so that the point of the heart pointed to the head of the cow for my brothers and pointed toward the tail of the cow for my cattle. The Lazy Heart brand. The restaurant, The Lazy Heart Grill, is the result of Debby's outstanding ability and love of cooking special dishes and seeing peoples reaction to her creations. She became well known for catering weddings, anniversaries, and large parties of all kinds. After she did a wedding for over 300 guests out of her little kitchen at home she decided that she needed a bigger kitchen............... so we spent the next three years building The Lazy Heart Grill. Debby got her kitchen and the small town of Saint Jo got an upscale, full service, dine in restaurant, just like the big city. The two old buildings that house The Grill were built around the late 1870's, so they are about 130 years old. The walls are large rocks that were brought in by horse and wagon. We had to remove the old flooring as much of it was in poor condition but we saved a good bit of the old wood and used it in the renovation which adds to the western atmosphere. Thank you for visiting our website and we hope to see you soon at The Lazy Heart Grill.